250 sq. foot studio apartment, with a queen bed and comfortable sleeper sofa, small dining table for two, a spacious closet with room for storing clothes and suitcases for longer stays. Oven, microwave and fridge, large backyard with a fire pit where you can grill s'mores or just drink a glass of wine by the fire. The backyard is shared but is usually never utilized by anyone. The unit is well stocked with the essentials you might need during your stay. Great alterative to a hotel room, and the most affordable rental this close to the beach. While we loved Jacksonville and the time we did have on the beach, the time in the room was not pleasant. You know it’s going to be small, but it is definitely smaller than the pictures make it seem. The cover photo of the backyard is a joke compared to what it actually looks like. There are no working lights hanging at all and no green chairs. The yard is not kept as well as the picture depicts. When you walk in to the studio expecting the beautiful blue and turquoise walls and accents, you are actually met with gray everything, which was a major disappointment. The table pictured is actually broken and fell on my baby’s face. That was unacceptable. Pictures two stools and only has one, so only one person can even sit down to eat at a time. I will say that the kitchen is well stocked with essentials. Other than that I was thoroughly disappointed that it looked nothing like the pictures, and new pictures need to be taken so that the renters are not feeling duped. Additionally, if you’re in this unit, you’ll be made to feel like a second class citizen Bc you’ll be required to park across the street while the upper renters enjoy a garage and two parking spaces each. Also be aware that next to the back yard is a lot where nothing currently exists and is surrounded by a tall chain link fence and grown up landscape. That is your view. All in all, disappointment characterized my feelings about this unit. This particular review was left by a disgruntled guests that tried to scam us in order to get a refund for her stay. She threatened to leave a malicious review if she did NOT get her money back, and here is the result. The content of this review is mostly false and misleading to any potential travelers and guests. In order to clear up any confusion I will address the issues outlined below. The chairs in the back yard are a different color as we change them out when they get damaged. The size of the unit is 250 square feet which is clearly listed in the description. The pictures do not, in any way, give a misleading impression of the size. We have updated the interior paint from a very strong and bright green color to a contemporary and very nice dove grey. The lights hanging outside disappeared during our last hurricane, to avoid any potential dangerous situations, we have decided not to hang any more lights from the building. Lastly I would like to point out that a similar size room at the motel/hotels close by go for 40-80% higher price per night, in addition you have to pay $29-39 per night for parking, and eat all meals out. We offer free parking 100 feet from the property. The studio is a great option for the budget minded traveler, its is by no means a 5 star hotel, or a luxury property, which is why we charge $75 per night. 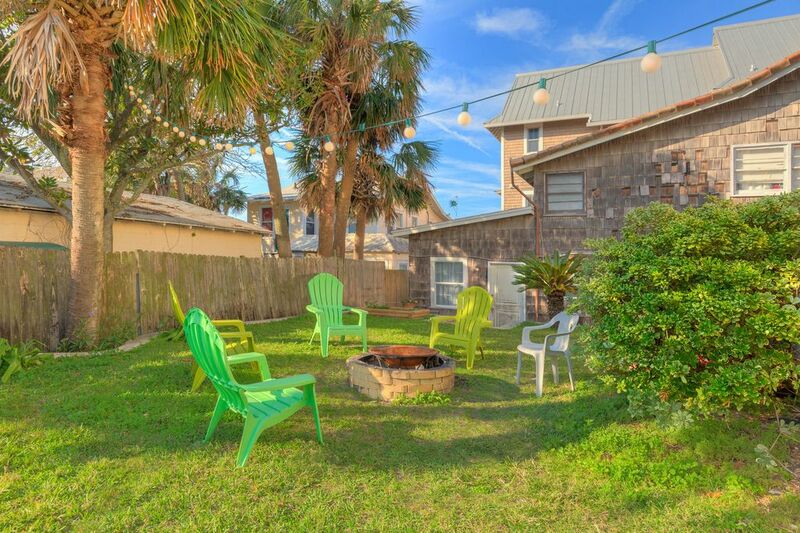 Hard to beat this cozy little rental close to the beach! Very comfortable bed, quiet at night, and decent accommodations! I would not hesitate to rent it again. Clean and quiet. Had a long weekend visiting a friend in Jacksonville Beach. Location of this small studio was excellent.